Discount Magic - Magic Seen Iss 72 (January 2017). Andi Gladwin appeared on our cover back in January 2011, and so exactly 6 years later we are delighted to welcome back again the workaholic lecturer, inventor, dealer and event organiser in order to go a bit further behind the man to see what really makes him tick. Andi is a hugely successful person, and if you want to learn how you too can make the next step in your magical pathway to stardom, then heed the advice starting on page 50 of Boris Wild, Mark Shortland, Andy Nyman and others as they explain how they have made the leap. Do you get disappointed sometimes when you purchase a close up trick that the blurb assures you is commercial only to discover that it isn't? Well, we help to keep you focused in Perfect For Table Hopping by setting out the 6 main things to look for in a worker close up effect. We also take the opportunity on the 20th anniversary of the Magic Circle's Young Magicians' Club to take a look at how this organisation is still proving to be an important stepping stone for young magical development. What else do we have for you? A Mexican Masterclass, a very strong batch of products this time in the Reviews section (lots of 4 and 5 stars! ), a great article by Eoin Smith on the range of magic podcasts now available to us all, a brilliant piece on the work of a Magical Interventionist who uses magic skills to reach out to disenfranchised young people, and of course other bits and bobs to keep you informed and entertained. 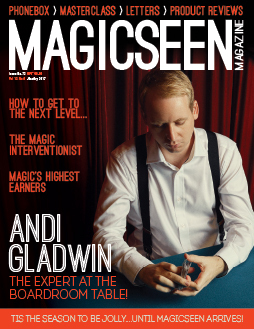 Magic Seen Iss 72 (January 2017) Andi Gladwin appeared on our cover back in January 2011, and so exactly 6 years later we are delighted to welcome back again the workaholic lecturer, inventor, dealer and event organiser in order to go a bit further behind the man to see what really makes him tick. Andi is a hugely successful person, and if you want to learn how you too can make the next step in your magical pathway to stardom, then heed the advice starting on page 50 of Boris Wild, Mark Shortland, Andy Nyman and others as they explain how they have made the leap.